The Parkinson’s Outreach Association presents educational seminars and round table discussions throughout the year. 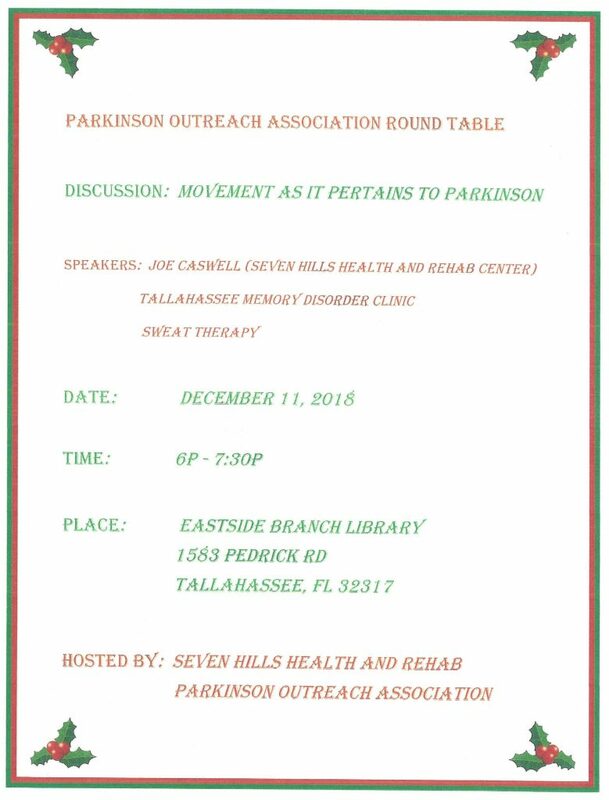 Please join us on Tuesday, December 11th for a round table discussion with local experts to learn more about “Movement as it Pertains to Parkinson’s Disease”. The discussion will start at 6:00 PM at the Eastside Branch Library located at 1583 Pedrick Road in Tallahassee. Speakers will include Joe Caswell of the Seven Hills Health and Rehab Center and representatives from the Tallahassee Memory Disorder Clinic and Sweat Therapy Fitness. Our goal is to teach people in North Florida about Parkinson’s disease so that they may be able to recognize early warning signs, feel supported in their decision to seek medical treatment, and are provided with outstanding emotional, physical and mental support. Because caregivers and loved ones often play the biggest role in supporting people with Parkinson’s disease, our organization offers resources for them as well to prevent fatigue and burn-out.